Hay'et Tahrir al-Sham continues to pose a challenge to Turkey, which has to either disband or attack it. After weeks of intense diplomatic activity,Turkeyseems to have managed to avert a full-scale offensive on Idlib province, the last opposition bastion in northwestSyria. Last week, Turkish PresidentRecep Tayyip Erdoganand his Russian counterpart Vladimir Putinannounced a planto establish a demilitarised buffer zone 15-20km into opposition-held territories. While Russia has indicated that it would not be launching an attack on Idlib for now, it continues to pressure Turkey to clear the province of “terrorist groups”, particularly Hay’et Tahrir al-Sham (the Sham Liberation Organisation, HTS). The HTS, previously affiliated toal-Qaeda, has a sizeable contingent of foreign fighters, including many Europeans, and is seen as a threat by all major foreign actors militarily involved in theSyrian war. Al-Nusra Front, HTS’s predecessor, was designated a terrorist organisation by the US, the UK, France, Russia, Turkey, Iran and the UN among others. Over the past year, Turkey has been trying to find a solution to the problems posed by HTS’ presence in Idlib province. Handling HTS – the main armed coalition in Idlib – will be Ankara’s biggest challenge in implementing theSochi agreement. A former HTS member, moderate opposition commanders and analysts told Al Jazeera that Turkey’s efforts to dissolve the armed group continue and that Ankara has also prepared a contingency plan for a military operation in Idlib. 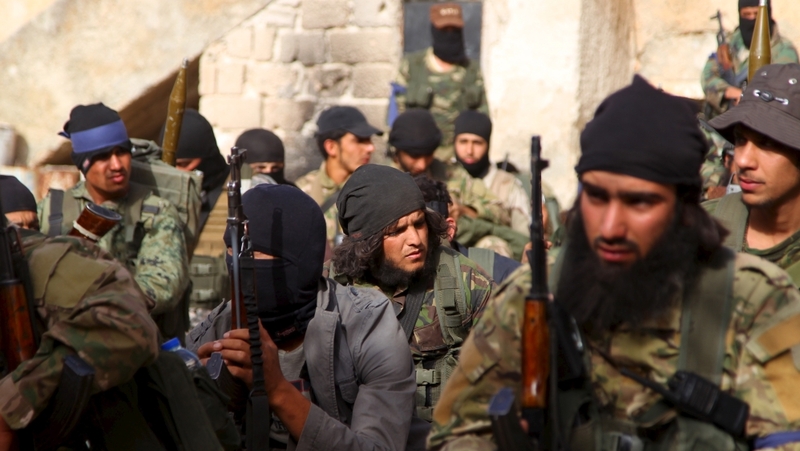 Since its creation in 2012, al-Nusra Front has gone through a number of transformations and iterations to adapt to the ever-changing situation in Syria. 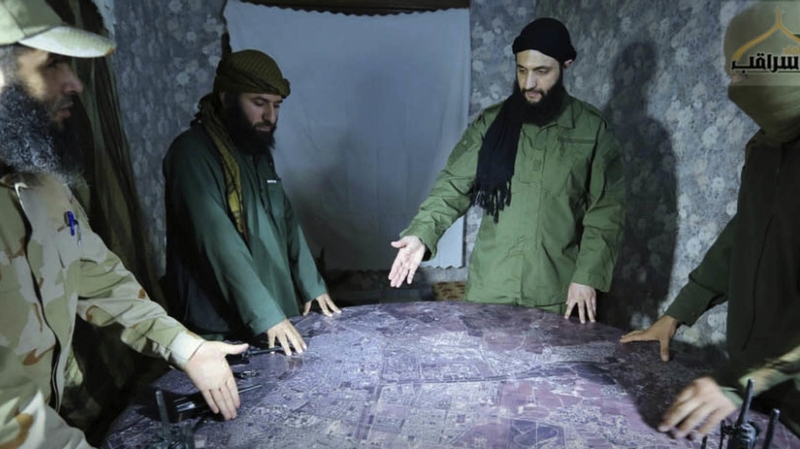 In the summer of 2016, itannounced its split from al-Qaedaand renamed itself Jabhat Fateh al-Sham (The Front for the Liberation of Sham) – a move largely seen as having no practical impact. In early 2017, after clashing with another hardline group in Idlib province, Ahrar al-Sham, itcreated a new organisationcalled Hay’et Tahrir al-Sham. Despite these various transformations aimed at shedding the “terror group” tag, HTS retains a number of high-ranking al-Qaeda members within its top tier, as well as a sizeable contingent of foreign fighters. According to Ahmad Abazeid, an Istanbul-based Syrian analyst, the organisation is split into various currents, including one that opposed the split with al-Qaeda and another that is pushing for the armed group to focus within Syria. Over the past few years, the main strategy of Turkish intelligence agencies has been to try to exploit these divisions and fracture the group from within, said Abazeid. 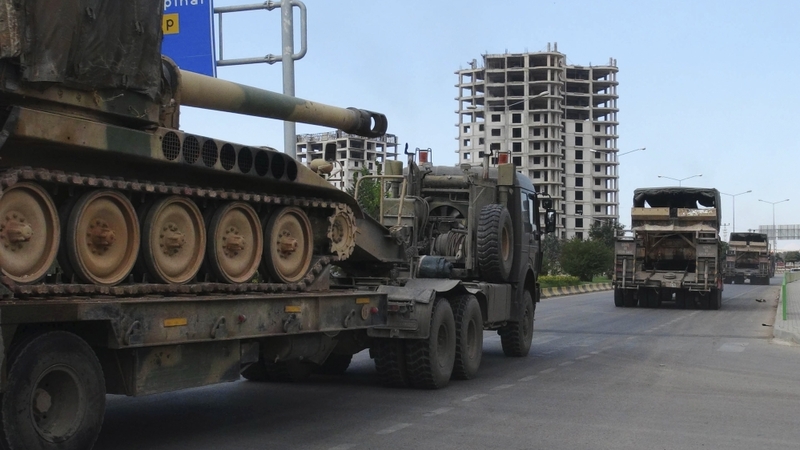 As Turkey started to deploy its troops in Idlib province late last year following thede-escalation agreement reached with Iran and Russia, it required the cooperation of all armed groups in Idlib, especially HTS. According to Khaled Rahal, a former moderate opposition commander, HTS’ leadership agreed to cooperate only if Turkey kept its military presence at the 12 observation points that Ankara had set up minimal. When Turkey started setting up the first outpost last October, it was HTS that provided security for them and continued to do so until the processwas completed in May this year. Abu Abdullah, a former HTS member who spoke on condition of anonymity, told Al Jazeera that HTS did not trust Turkey and was worried about its military presence inside Idlib. For that reason, the armed group set up its own well-armed outposts next to each Turkish observation point. A number of high-ranking non-Syrian Arab members of the group objected to cooperation with Turkey and some of them left to create a new splinter group called Huras al-Din (the Guardians of Religion) in February. Some HTS foreign fighters have already joined the group and more are expected to follow as HTS sheds its foreign elements under pressure from Turkey, Abu Abdullah said. Over the past year, HTS has also been cracking down on various foreign armed groups, especially those formerly affiliated with the Islamic State of Iraq and the Levant (ISIL, also known as ISIS). According to Abu Abdullah, HTS launched various operations against ISIL cells, arresting or killing most of its former members. A few months ago, it attacked a camp of foreign fighters who had fled from Iraq after thebattle for Mosuland started arming themselves, Abu Abdullah said. About a month and a half ago, it also arrested members of an armed group made up of French foreign fighters. The leader, Omar Omsen, was released on condition that he dissolve his faction, Rahal told Al Jazeera. As Russia escalated its threats to launch the offensive with Syrian government forces on Idlib this summer, Turkey had to step up its efforts to engage HTS and convince it to dissolve. According to Abu Abdullah, before the September 7 summit between Turkey, Russia and Iran, Ankara officials were meeting with the HTS leadership on a weekly basis to negotiate. Two moderate opposition commanders Al Jazeera spoke to also confirmed that they were aware of such communication. HTS agreed to disband and go under the umbrella of another moderate opposition faction, as long as its leader Abu Mohammed al-Joulani remained “amir al-harb” (the head military commander) of that group and the foreign fighters were guaranteed their safety, Abu Abdullah said. It was on the latter point that the two sides could not reach an agreement, as Turkey demanded that the group give up all foreigners. “This can’t happen. The left and the right hand of Joulani are foreigners,” he pointed out. According to him, foreign fighters within the HTS ranks have become even more distrustful of their Syrian peers within the organisation. The number of foreigners, including non-Syrian Arabs, is estimated to be around 3,000-4,000 out of the 16,000 HTS fighters. Rahal, the former commander, told Al Jazeera that the core of the organisation consists of about 40 individuals, many of whom are foreigners, living a highly secretive life and hiding their movements. In the past, US drone and bomb attacks have targeted a number of foreigners within the top tier of the organisation, including Abu Faraj al-Masri and Abu al-Khayr al-Masri who were killed in 2016 and 2017 respectively. According to Rahal, these incidents have been limited only to people close to al-Qaeda, who opposed the break-off in 2016 and who the central leadership might have been interested in eliminating. Reaching a dead end in negotiations with HTS and facing increasing threats of a Russia-backed offensive, Turkey had to seek a provisional plan. Over the month of August, various Turkish officials, including Foreign Minister Mevlut Cavusoglu, intelligence chief Hakan Fidan, and Defence Minister Hulusi Akar, visited Moscow. Middle East Eye, a London-based news website,reportedthat the first plan they proposed was for Turkey to launch a military operation – similar to the ones in Afrin and Northern Aleppo – and take over Idlib, which Russia reportedly rejected. Turkish officials then offered to establish a demilitarised zone and eliminate HTS from the province – an offer Moscow accepted, making it official at the September 17 summit between the two countries in the Russian resort city of Sochi. While the details of how this agreement will be implemented remain unclear, Turkey has said that moderate opposition groups will remain within the demilitarised zone but all others (including HTS), as well as any heavy weaponry, will be withdrawn. According to Abu Abdullah, before making the announcement, Turkey must have obtained HTS’ consent in exchange for security guarantees for the group and it retaining control over the rest of Idlib. The decision has caused a lot of discontent within the second and third-tier members of the organisation, particularly the foreign fighters, Abu Abdullah said. The HTS leadership probably anticipated that reaction but saw it as a less costly outcome than defying Turkey, which has the support of the civilian population, and risking a Russia-led offensive on Idlib, he added. One moderate opposition commander who asked not to be named confirmed that HTS accepted the Sochi deal, but that there were tensions between different currents within it. The armed group still has not made an official statement on the subject. Late last week, Huras al-Din rejected the Sochi agreement through a statement released on messenger apps WhatsApp and Telegram. Abu Abdullah also said that meetings between Turkish officials and HTS continue and that the armed group has not started making military preparations in anticipation of an attack. The HTS fighters also accompanied theTurkish military convoyswhich were sent after the September 7 Tehran summit to Idlib province to reinforce the observation points. The Turkish foreign ministry did not respond to a request for comment on this matter. On August 31, Ankara designated HTS a terrorist organisation. According to Abazeid, it is still likely that Turkey will eventually have to pursue a military campaign against HTS in order to stave off a Russian offensive. It could either do so directly by deploying its own military, or by pushing other factions to attack. Earlier this year, Turkey pushed for the unification of armed groups considered moderate opposition with the aim of establishing a united military front, in case Syrian government forces attacked or HTS had to be forcefully dissolved. Such an idea had been circulating since last year among moderate opposition factions. In May, a new coalition called al-Jabha al-Wataniya lil-Tahrir (National Liberation Front, NFL) wasestablished, uniting Turkey-backed Failaq al-Sham (Sham Legion) and the Free Syrian Army (FSA), a loose formation of factions founded in 2011 by defecting Syrian army officers. In August, other major armed groups joined the formation, including the more hardline Ahrar al-Sham, Nour al-Din al-Zinki, Soqour al-Sham and Jeish al-Sham. Turkey has also been trying to secure access to Syria’s airspace, which is currently controlled by Russia. Two Russian sources said that giving Turkey access to airspace over Idlib for a future operation against HTS is being discussed in Moscow. Ankara previously managed to secure air corridors above Aleppo province for its two operations,Euphrates ShieldandOlive Branch. One challenge that such an operation could face is the persistent disunity among moderate opposition groups within the NFL. Both Abu Abdullah and Rahal said the umbrella group is unlikely to put up a fight against a more organised HTS, as fighters from the various factions lack motivation. Abazeid disagreed and pointed out that NFL’s fighters are much more numerous than HTS’s, numbering around 60,000. Earlier this year, two of the NFL factions – Ahrar al-Sham and Nour al-Din al-Zinki – were able topush HTS outof a number of areas in Idlib and Western Aleppo provinces, he said. An FSA commander, who spoke to Al Jazeera on condition of anonymity, also said that NFL has the capacity to take on HTS. It has not attacked so far “because the political decision to get rid of HTS has not been made yet [on an international level],” he said, adding that the problem is that the US and Europe “still stand by the Kurds” and have not backed Turkey. The commander, whose faction used to receive funding from the US, said there is renewed interest from the West, particularly European countries, in the fight against HTS and hardliners in Idlib. There are currently negotiations between a number of Syrian opposition factions and organisations to secure funding from European countries, he added. Key to the defeat of HTS is the hostility of the local people towards the armed group, the FSA commander said. 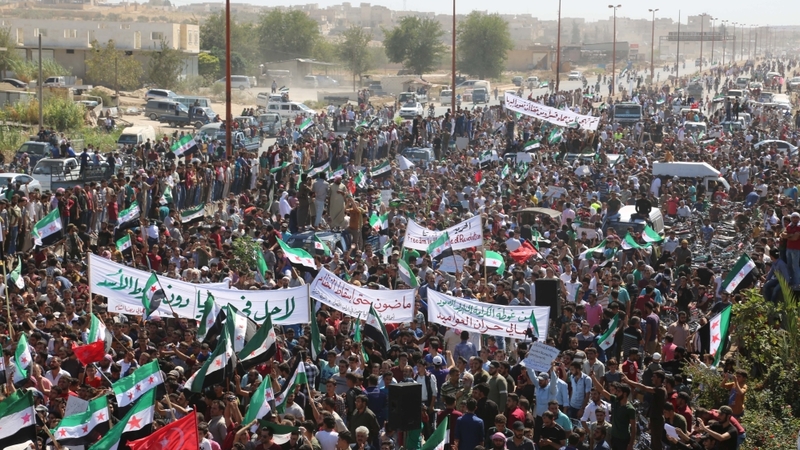 Since HTS’s predecessor, al-Nusra Front, took control over various areas in Idlib, there has been growing tension between the group and local people and factions.Protestsagainst its oppressive methods have been held across Idlib province over the past three years. In 2016, people of the city of Maarat al-Noumanrebelledagainst al-Nusra Front after it attacked members of a local FSA faction and its facilities. In the aftermath of the attack, civilians stormed the HTS headquarters in the city and set it on fire, launching a months-long protest against the group’s presence in the area. Earlier this month, during protests against a possible Syrian government offensive on Idlib, HTS fighters shot at the crowd after it broke into chants against the armed group. HTS has also been known toharass and arrestSyrian pro-revolution activists and has been accused ofkidnapping and detainingcivilians to extort money. A 2017 report by the Doha-based Syrian Network for Human Rightsdetailedkillings, torture, arbitrary arrests and attacks on local councils and aid organisations committed by HTS fighters. Abu Abdullah admitted that such violations occur, adding that the HTS security apparatus, which has the biggest budget of all internal structures, is mainly responsible for them. “They have the methods of the Shabiha, they are just like them. They know everything about you,” he said referring to the infamous state-sponsored militiagroupsthat were involved in the crackdown on peaceful protests which erupted in Syria in 2011.